Specialty gun and knife storage now has a wide range of options. Whether you seek to show off your weapons, exhibit a storage cabinet itself, or simply want to secure these special belongings, there is a storage method or container for everyone. Here are five great ways to store those specialty guns and knives. Some cabinets and safes are geared towards showcasing a collection rather than keeping it secure to an extreme. These safes and cabinets typically feature gorgeous metal and woodwork, glass panels for unblocked view, and several shelves and drawers within. These storage methods do lock and can be very beautiful, but aren’t the most secure option. They can also be expensive. Those not concerned as much with display often go the route of a strong safe. A strong safe is usually constructed of thick metal and looks much like the stereotypical, money safe. These are a great option for those seeking security in storage. But beware, a strong safe can be heavier than a grizzly bear after a day at the salmon stream. 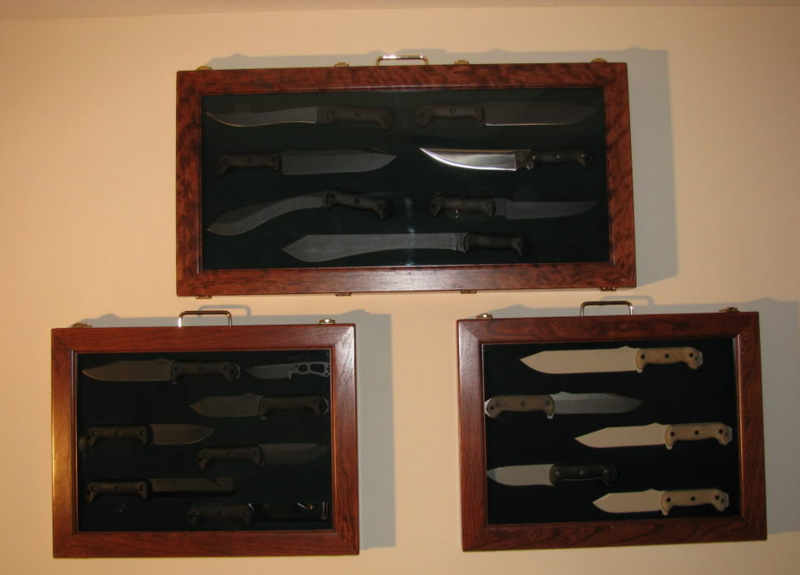 A special storage room does require some additional resources, but a dedicated, special storage room can sometimes serve as the ultimate solution for gun and knife storage. Such a room can be hidden or non-hidden and can be made to custom cater to any collection. Depending on room size, additional perks can even sometimes include lounge space, decorative freedom, and inclusion in home emergency planning. Can you say “ultimate man-cave?” You can also rent a storage unit off-site if you are concerned with safety or security. Drawer Insert setups are meant for convenience and quick access. There is also an element of security involved in that quite often these can have an “opening trick” or even be completely concealed. The concept is simple: a pistol or knife drawer can be designated within a normal cabinet or chest-of-drawers. This “special” drawer may look like others around it or may even appear as a “blank”, or external paneling, not an actual drawer. Now that’s sneaky! The magnetic display strip is yet another display-minded storage option. This one is definitely not geared toward security purposes, but can look very cool. Here, magnetic strips are mounted to the wall or anywhere else chosen. The user then sticks the gun or knife to the strip; and that’s it. Just remember that this isn’t the best idea if storing guns loaded and cocked. No matter how seemingly perfect your storage method may be, this doesn’t mean that your chosen method also presents the best conditions for preserving your gun or knife. Also remember to check into the material’s possible tendencies to crust. Also consider the possible ramifications of placement near vents, windows, in areas vulnerable to temperature or humidity extremes, and so on.